I Will Buy You is, for all intents and purposes, a baseball picture. But not one that spends much time on the field. In fact, we only see a couple of swings of the bat during it's near two-hour running time. 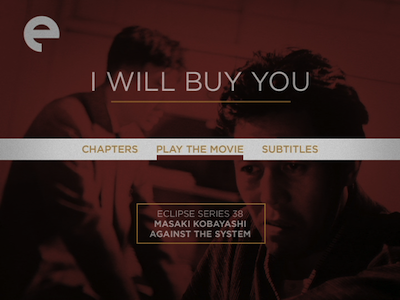 Rather, I Will Buy You is more like an early prototype for Moneyball [review]: it's about the men who control the purse strings and make the teams. It’s capitalism as sport, with the players being substituted for the bat and ball. The script follows Daisuke Kishimoto (Keiji Sada, also in Kobayashi’s masterwork, The Human Condition [review]), a talent scout for the Toyo Flowers, a franchise in a small slump as their new, untested manager whips the squad into shape. Baseball is a ruthless business, and Kishimoto has to be practical in his decision-making. 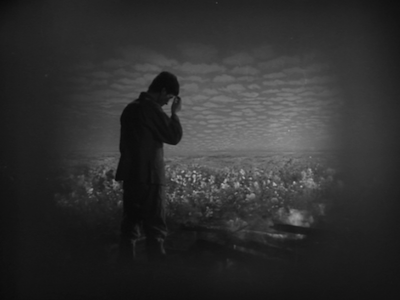 In the film's opening scenes, he is on his way to sign a pitcher who lives in the sticks, only to discover the boy has lost a finger working in a factory and turn away without seeing him. 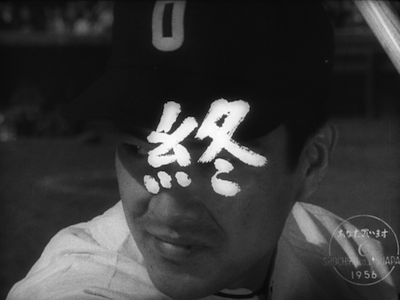 Kishimoto next turns his sights on Goro Kurita (Minoru Ooki), a college player with a power hit. The entirety of the Japanese league has zeroed in on the boy, so Kishimoto is going to have to be clever. For the time being, Kurita has a gatekeeper, Ippei Kyuki (Yunosuke Ito, Sanjuro [review]), his private coach for many years. On first meeting, Kyuki presents himself as a moral personage, concerned more for the boy's future than for his own personal gain. Initial impressions change, however--the longer Kishimoto courts Kyuki, the more flexible he finds the man. Baseball, it would seem, is not Kyuki's only game. Ignoring his penchant for gambling, he is most up-front about being in the import business, bringing fruit and other products from China. 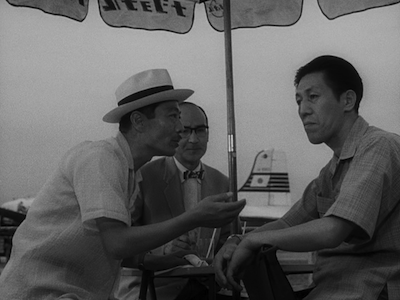 The rumors that he spied for China during the war may be born of jealousy, or they may be indicative of a truth where Kyuki really is a "leech" using Kurita for his own gain. It doesn't help that the married father's mistress (Mitsuko Mito, There Was a Father [review]) is the sister of his prized pupil's girlfriend. In all of I Will Buy You, Fueko (Keiko Kishi, returning from The Thick-Walled Room) is the only one who we trust, and so her claims that Kyuki is faking his life-threatening gallstone affliction gives both us and Kishimoto pause. It's a bold statement from the lone figure who appears to be unimpeachably moral. Hopefully I didn't make all that sound irresistible, because it's actually kind of dull. There is a good drama here. Both Sada and Ito are very good, and they feed each other well. If the coach is a con man, he never tips his hand, and with the scout so effectively communicating the ethical conflict, we know whose shoes we're supposed to try to walk in. The problem is, there is not enough variance in the story, nor enough legitimate tension beyond wondering who Kurita will sign with, to justify the extended running time. There is an excess of low-decibel villains, and a real deficit of heroes. 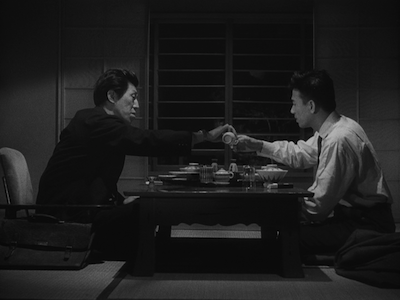 What impresses beyond the strong acting, however, is Kobayashi's increased confidence behind the camera. The director stages the mundane events with a journeyman's hand. 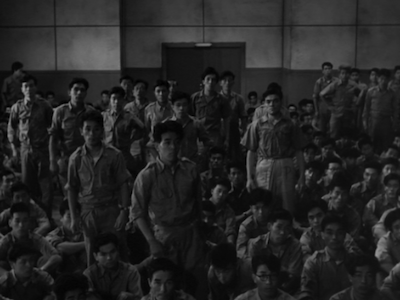 The framing in the scene where Kurita finally reveals his decision is particularly impressive. Five characters in three different fields of vision all act and react without the technique overshadowing the content. Then again, maybe more hot-dogging from the director, or even the writer, might have helped. To mention Moneyball again (which I Will Buy You definitely resembles way more than, say, Pride of the Yankees [review] or Bull Durham ), both Aaron Sorkin and Bennett Miller saw that they needed to kick the execution up a couple of notches above the subject. They found the energy in the dry landscape of business athletics that Kobayashi never takes off the bench. 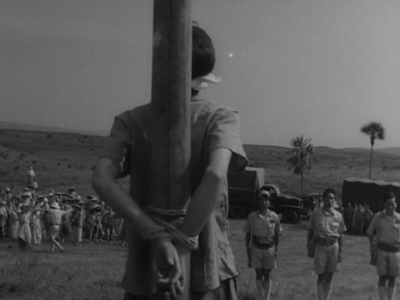 Japanese movies made after World War II that deal directly with the post-War conditions following the country's defeat and grappling with the U.S. occupation offer a unique glimpse into a particular time and place that you can't really find anywhere else. I'd suggest the closest equivalent is American-made movies about Vietnam and the climate of unrest that existed as a result of that conflict. 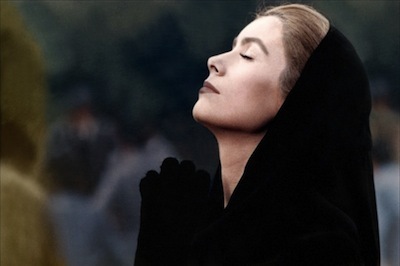 Perhaps if movies had been around after the U.S. Civil War, a Southern cinema might have emerged that would have been akin to what Masaki Kobayashi, Seijun Suzuki, and others created in the 1950s and 1960s. They engaged their nation's shame and struggles honestly, rather than the self-mythologizing that we see in American westerns that feature former Confederate soldiers as protagonists. 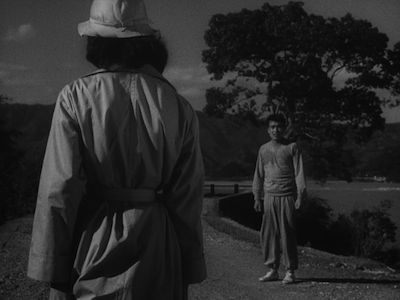 The Eclipse boxed set Masaki Kobayashi Against the System, as its name suggests, is meant to collect early Kobayashi films that wrestled with difficult and sometimes controversial subjects. 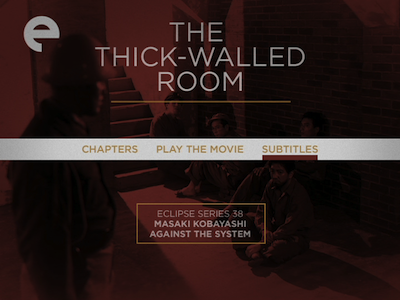 The set leads with his third film, the 1956 drama The Thick-Walled Room, a prison story written by acclaimed novelist Kobo Abe (The Face of Another). In particular, The Thick-Walled Room casts its eye on men who have been tried as war criminals and sentenced to an indefinite stay in Sugamo Prison. A handful of them share a bare cell, the thick-walled room of the title, under guard of the American soldiers who run the place. They dream of their eventual release, and a righting of the wrong that was done to them. As with any such ensemble drama, The Thick-Walled Room presents a diverse cast of personalities. Kimura (Tsutomu Shimonoto) is a poet, while Nishimura is a smartass. There aren't just Japanese men in Sugamo: Kyo is a Korean soldier who was in the wrong place at the wrong time. 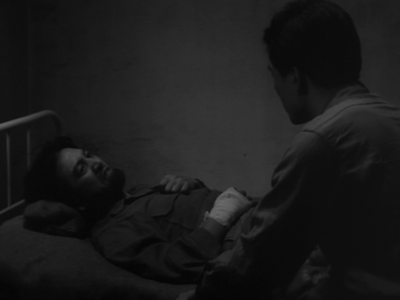 Others shun him for being a Communist, particularly as the news of the conflict between North and South Korea filters into to the prison, but as The Thick-Walled Room progresses, others subtly shift toward Kyo's position. Ultimately, the prisoners form their own union, and began to organize to lobby for their release. 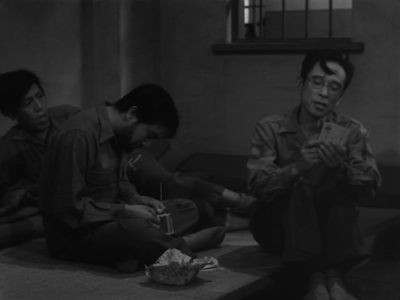 The two main stars of The Thick-Walled Room are Yamashita (Torahiko Hamada) and Yokota (Ko Mishima). Both are sensitive men who still have family waiting for them in the outside world. Both are haunted by the brutality they were forced to inflict on the enemy. Yokota is a romantic who dreams of a girl he hopes to reconnect with when he's free. Little does he know that Yoshiko (Keiko Kishi, The Makioka Sisters [review]) is now a prostitute. 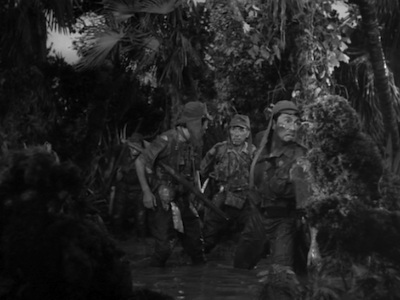 In the flashbacks, we see that she is fascinated by American servicemen, and while Kobayashi doesn't address the plight of women in post-War Japan as directly as Seijun Suzuki does in movies like Gate of Flesh, there is some understated commentary here. If a country can be judged by how it takes care of its women and children, Japan is failing. Just beyond Sugamo's fence, women sell themselves and little kids hustle to shine the boots of their occupiers. Yokota serves as a sort of social conscience for the film. He is literally a translator, being the one who speaks English, but symbolically this carries over to his being the character who theorizes about prison life and whose ideology evolves. He is the one who explains the experience to his comrades and, by extension, the audience. "Everybody's turning to dust little by little," he tells his brother. He sees the men who are locked up as growing more desperate, doing things they should otherwise be ashamed of to survive and inventing justifications to assuage their guilt. 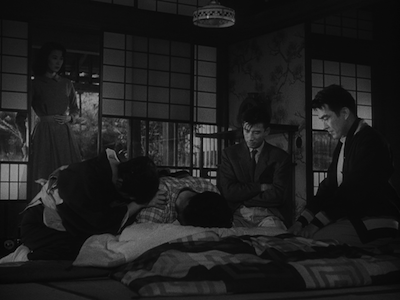 In the case of one of his roommates, Kawanishi (Kinzo Shin, Youth of the Beast), the shame is too much. 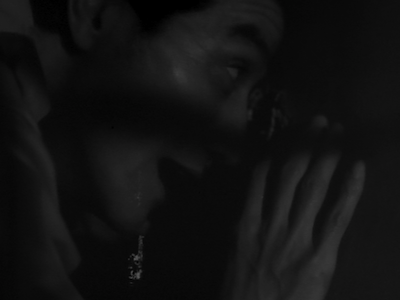 In The Thick-Walled Room's most visually memorable sequence, Kawanishi is left alone with his hallucinations. Holes are punched through the walls, like shotgun blasts coming from outside, and through each opening, the man sees his sins and the judgment of his fellow citizens. It's like he's under siege from his own memories. Suicide is a looming presence, and more than one man tries it as a means of escape. Yamashita has the most direct example of injustice. His superior not only bullied him into murdering an innocent man, but he then testified against him in court. Interestingly, the crime the Americans treat as the most severe is his allegedly having stolen food. Yamashita is to be punished for stealing a loaf of bread, not unlike Jean Valjean in Les miserables [review]. There is a poetic connection between Yamashita and Yokota in that the American that Yokota was forced to beat was also being punished for stealing food to survive. The two men deal with things differently, however: Yokota is given to external expression, while Yamashita internalizes. It's somewhat ironic, then, that The Thick-Walled Room's major climax is Yamashita getting to confront his persecutor directly. The incident brings some closure, and his brief taste of freedom brings the man some peace, but at the same time, it provides no real answers. It's a bittersweet conclusion. 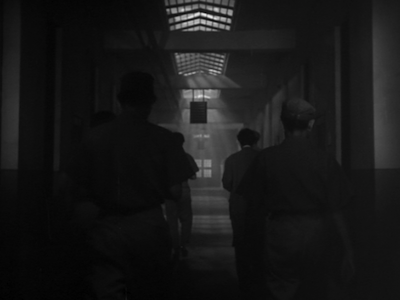 Yamashita returns to his cell ready to embrace his new family. The men who share his fate have made their own community, one that will provide them succor as they forge ahead while also reinforcing the sad truth that they are exiles in their own country. Another shorty, this one written for the Portland Mercury, a year ago. Through this link, you can read the version they published. Below, however, is my rough draft, which is longer than the space allotted to me at the time. 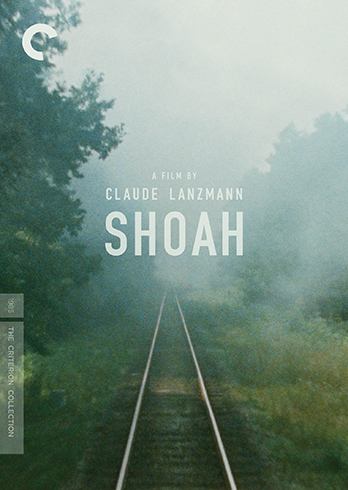 About four hours into Claude Lanzmann’s nine-and-a-half-hour Holocaust documentary Shoah, the importance of his monumental undertaking becomes all too clear. While interviewing a group of Polish Catholics on the steps of their church, mere miles from the Treblinka death camps where 400,000 Jews were murdered, an unnamed man pushes his way through the crowd to emphatically inform Lanzmann of a broken-telephone anecdote about a who rabbi instructed his people to go with the Nazis willingly, as the time to answer for the crucifixion of Jesus was at hand. It’s an unsettling moment. Lanzmann has been rooting around for just this kind of justification, and there it is. That one of the only two people to escape Treblinka is standing in the group, silently observing, makes it all the more haunting. These are records that needed to be set down. The technique in Shoah is raw, but it’s not about cinema, it’s about making sure the stories don’t fade away. Lanzmann gathers up as many witnesses as he can--survivors, observers, and persecutors--and pushes them to tell their version of events. With them, he travels to the notorious camps and ghettoes, tracing the long march of death the victims traveled. Completed in 1985 after a decade of work, Shoah is a towering tribute to those lost. It’s also difficult to sit through, both in terms of content and presentation. Whether you go straight through or split it up, expect a long haul. 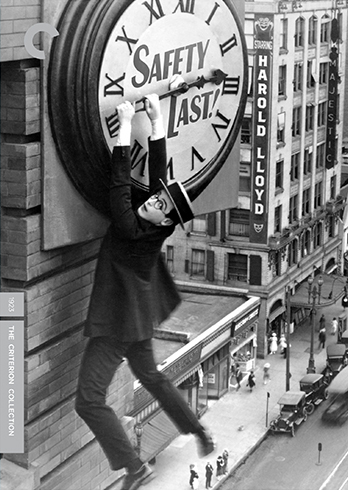 Silent screen legend Harold Lloyd made comedy out of calamity in his 1923 masterpiece Safety Last! The bespectacled performer plays a small-town boy trying to make it in the big city so he can marry his sweetheart. As a personality, Lloyd is a combination of silly and sweet, but his true star power comes from his daring athleticism. The more elaborate his setup, the more hilarious the payoff. The indefatigable klutz pratfalls his way through a series of expertly timed visual gags, escalating to a hysterical climax on the outside of a skyscraper. 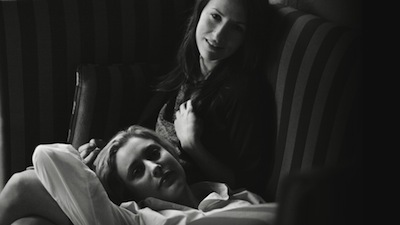 * Frances Ha, Noah Baumbach, having found a new muse in Greta Gerwig, strikes out anew. * Gimme the Loot, street-level cinema verite following two graffiti artists preparing for a big tag. * The Great Gatsby in 3D has two-wasted dimensions. Shtick and spectacle from Baz Luhrmann. * The Iceman, a biopic about one of America's most notorious contract killers. Michael Shannon lends the role intensity, but the script only touches the material gingerly. * The Purge, Ethan Hawke and Lena Headey in a tense little thriller with inklings of political allegory. * Sightseers, the new film from Ben Wheatley, a rebel in search of applause. Take a tour of misanthropy. * May 3: the food documentary The Food Hunters, Harold Lloyd's classic Safety Last! newly restored, and the 18th-annual HP Lovecraft Film Festival. * May 10: a two-week film noir festival at Cinema 21; Rock Hudson starring in John Frankenheimer's whacky psych-out Seconds, and the political/social documentary The Mosque in Morgantown. * May 23: Douglas Fairbanks as The Thief of Bagdad; Paul McCartney gives us a Wings Rockshow; the Experimental Film Festival 2013. * May 30: Take a visit to Skull World; look at the making of two different forms of art with Becoming Traviata and Bel Borba Aqui; get gay married for a greencard in I Do. * June 7: underground crime fiction by way of Flamingos; the activist-focused environmental documentary Elemental; and Stress Position, an agitprop art school prank. * Love and Pain and the Whole Damn Thing, a 1973 disjointed road-trip romance from Alan J. Pakula. * Save the Date, a wedding-centric sorta rom-com with Alison Brie and Lizzy Caplan, co-written and featuring artwork by cartoonist Jeffrey Brown. * Wake of the Red Witch, a seafaring, bodice-ripping potboiler with John Wayne.